This gothic style building was built between 1842-1844 by Augustus Pugin (1812-1852) and James Gillespie Graham (1777-1858) to originally house the General Assembly of the Church of Scotland, the kirks presiding body. 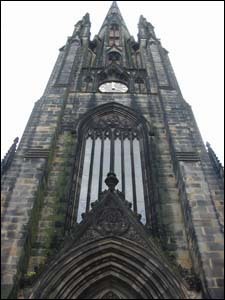 The Tolbooth Kirk's impressive octagonal spire at 74m (240ft) is the tallest in Edinburgh. It has not been used as a kirk since 1984 but opened as THE HUB in 1999 Endinburgh's Festival Centre. There is a restaurant/cafe with indoor and outdoor seating.